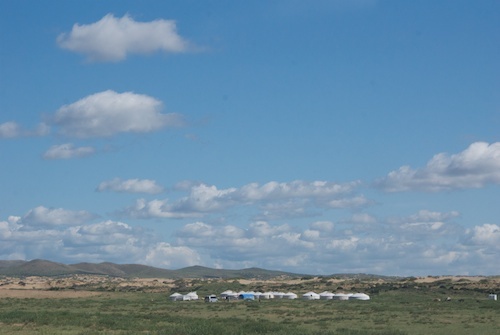 The next stop on the “artist’s tour” was Arburd Sands ger camp. This was more a “cultural” stop, than for wildlife viewing, but we got some of that, too. This was the third time I had stayed at the camp and it was great to see owners Batbadrakh and his wife, Densmaa, again. 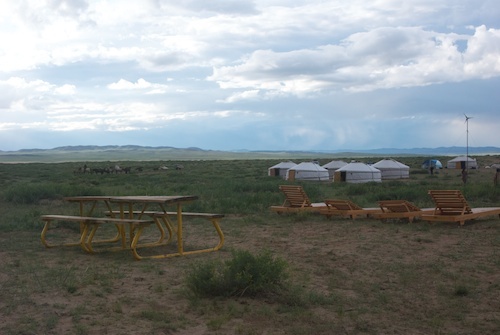 Arburd Sands ger camp; the dune complex behind the camp is about 20km long and is one of the northernmost extensions of the Gobi. 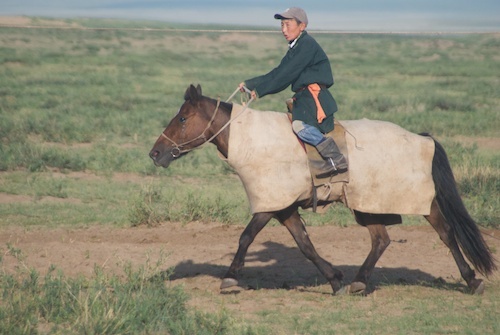 Exercising a young Mongol race horse; the owners of the camp are members of a prominent horse racing family. 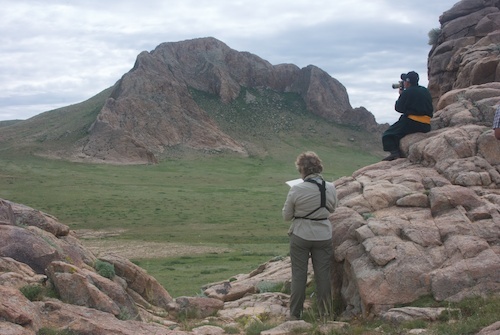 We took a day trip to two local sacred mountains; this is Baga Hairhan Uul (Small Sacred Mountain). 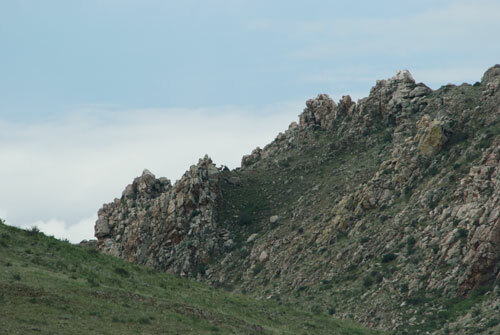 Scanning the mountain paid off with this sighting a few female Siberian ibex; you can just see one on the lower right side of the second pointed rocks from the left, the head and half the body are visible. 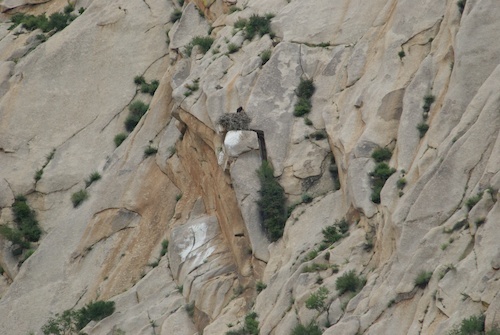 Nearby, to the left of where we were sitting, was a cinereous vulture nest with an adult and fledgling. 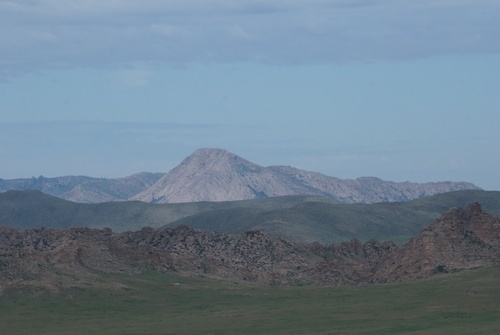 Our second destination...Zorgol Uul, one of my favorite mountains. 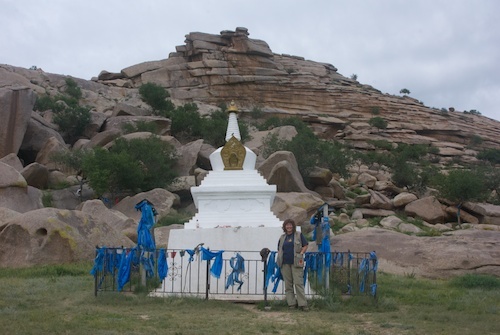 On the south side is this lovely stupa; the fence is festooned with khadag, blue offering scarves. 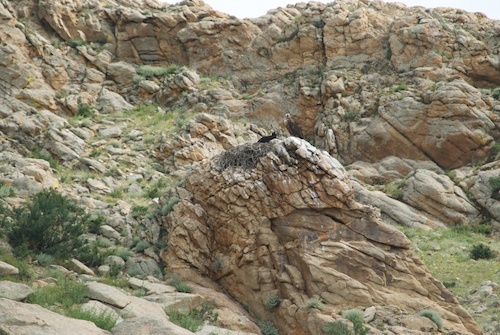 On the "front" facing the main road south was a cinereous vulture nest that I don't remember seeing on previous trips. 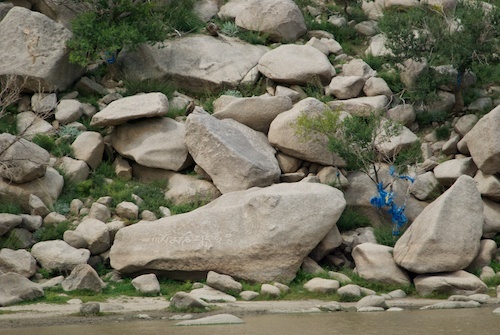 At the base of the mountain is a small seasonal lake; to the left of the khadag is a large rock with a Tibetan inscription and if you look up to the top you can see a black kite perched on another big rock; quite a composition. 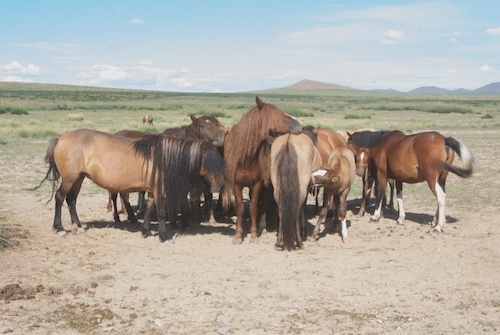 The family that runs the ger camp is known for its horses. One came in third in the State Naadam race this year, which is a big deal since the first five are considered almost equally winners in a 35km race that may have over 400 entries; I asked if the horses were nearby and could we take pictures of them and, yes, they were only a kilometer or so away. The stallion's manes are allowed to grow and grow and grow....because that is believed to give them strength. We got some great shots! 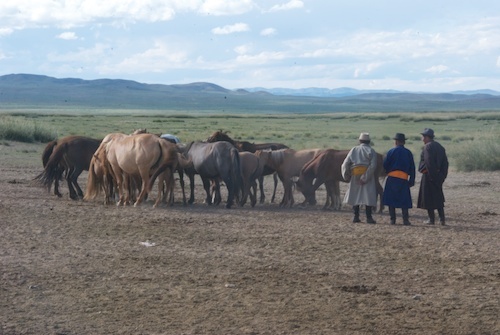 While we were there, three men, probably relatives or friends of the owner, came by to check out the horses. One of the highlights of the entire trip was seeing Sodnam again; I "met" her when my husband and I were at Arburd Sands in 2008 and we took to each other immediately even though we couldn't speak each other's language. She's 92 now and I'll bet she's caused some mischief in her time. She's Batbadrakh's brother's wife's mother. 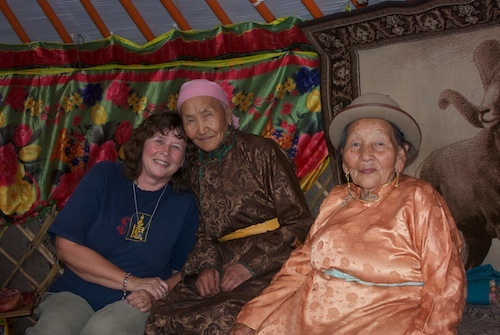 The lady on the right is the mother of Batbadrakh and the widow of Choidog, his father. 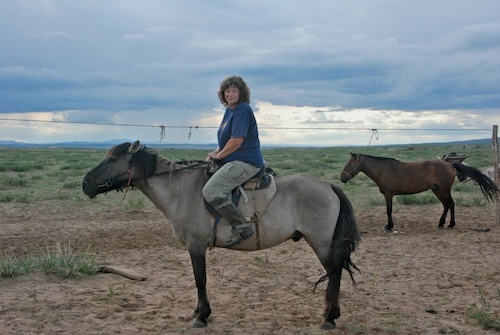 Then it was our turn to ride; I really liked this sarel (grey) gelding and asked Densmaa if they could box him up and send him to California; a joke since I don't think Mongol horses would do well at all in our higher humidity sea level climate. The Arburd Sands ger camp is set up in a new spot every year or so to protect the land; this year Densmaa grinned at me, pointed to the table and lounges and said "How do you like our beach?" We liked it a lot even though it's a bit far from the ocean. 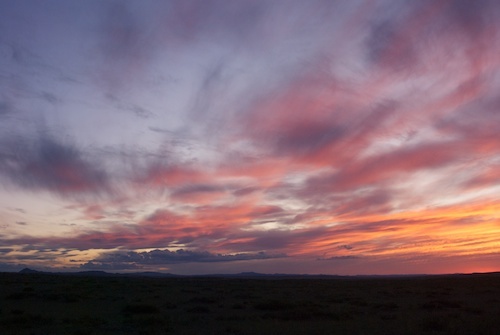 And one of the reasons is that it was a great place to watch spectacular sunsets like this one. 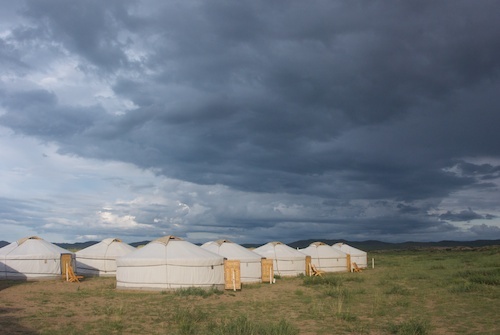 There really is nothing quite like storm light over Mongol gers. Small Painting Listings On eBay Are Back!